Cantala is not available through our online partner for your requested time. Description: Cantala is the perfect hideaway for a delicious meal. Meet us at Cantala to enjoy the simple goodness of spectacular food. Each dish reflects our intense focus on flavor and dedication to seasonal, sustainable, and local ingredients. Layered with dark hues of forest green, rattan, cork and earth brown the space is earthy and features collections–from the cabinets filled with reclaimed terra-cotta pots full of moss and cacti. 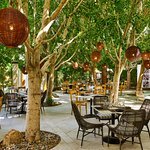 The outdoor dining is a mix of varied furniture tied together with festive woven baskets in the natural canopies of the trees. The space is cozy and intimate, with nooks to explore. Rodrigo is a wonderful guy. He made sure I was satisfied with my dinner and the service. When he saw me the next day during my stay, he greeted me and insured that if I had any questions or would like to join them again for dinner he would be delighted. So far I have eaten here twice and each time the food has been phenomenal! Next time I stay I'm definitely coming back! Thanks Rodrigo and staff! I wanted to take my husband for a nice birthday dinner but not break the bank. 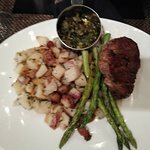 I was pleasantly surprised how affordable the restaurant was! For two entrees, a beer, and dessert we only paid $67! 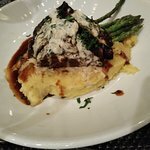 I had the short ribs which melted in your mouth, garlic mash and seasoned asparagus! The chocolate molten cake was fantastic! We always stay at the Riviera Hotel when we come to Palm Springs, but had never eaten dinner at the restaurant. Don't think we will ever eat here again, and I would not recommend this restaurant I am very sad and sorry to say we had a horrible experience, because I love the hotel so much. The food was excellent, but the service was the worse I have ever experienced. We had to ask 3 different people 3 times for bread and waited forever for our entre to come out. At one point our waitress disappeared, never to return not even to bring us our check. We asked twice for someone to go get her so we could order more drinks. Finally we complained to manager, who was very professional and apologetic. This particular waitress was just so awful. .
We went in as a walk-in for dinner, and were seated on the patio. So far so good. Someone brought us ice water and bread with butter, again, so far so good. Soon our water glasses were empty, and the ice melted. Our bread bowl was also empty...and still we sat. Finally we waved a busser over and asked for drinks, so he went and fetched out server. The drinks came about 20 minutes later. The couple beside us just got fed up with the horrible wait times and left. We finally ordered food, and settled in for the wait. What a shocker, the food was garbage. I ordered a $27 Flat Iron steak medium rare, and when it showed up it was well done. We sent it back and asked for the bill. At least they didn’t make us pay for the steak. But come on, how are you selling well done steaks in 2018?? It’s just a shame that the food was wasted. My wife and I travel often, and in 10 years this is the first meal we have had to send back. This restaurant looks nice, but that’s all I can say that’s good about it. The appetizers we ordered were bland and greasy. Skip this one. We were staying at the Riviera so having the option to order from and eat here was very convenient. We rented a cabana for the day and the service was wonderful, the cocktails good and fairly priced and the finger food was good though we could have used a few more options. The breakfast buffet was nice, lacking a few more options but having eggs Benedict on the offer in the buffet was a nice touch. We ordered from the restaurant at night and ate in the lobby and the food was good though the meat portions were on the small side with a large price tag. All in all, for the meals you don't feel like leaving the hotel, you're in good hands. I wouldn't come to eat here if I wasn't staying here though. Been to Cantala? Share your experiences!